congratulations melanie! i emailed you. 🙂 if you didn’t win, remember there’s a tutorial for you to make your own! for those who asked, my favorites of the more traditional Christmas songs are O Holy Night and Carol of the Bells (popular picks in the comments!). i’m also a big fan of the sufjan stevens christmas albums. but the Christmas song that makes me laugh in spite of myself is chiron beta prime by jonathan coulton. have you heard it? it’s amazing. switching gears a bit, i’ve been meaning to blog this for a while and never got around to it! 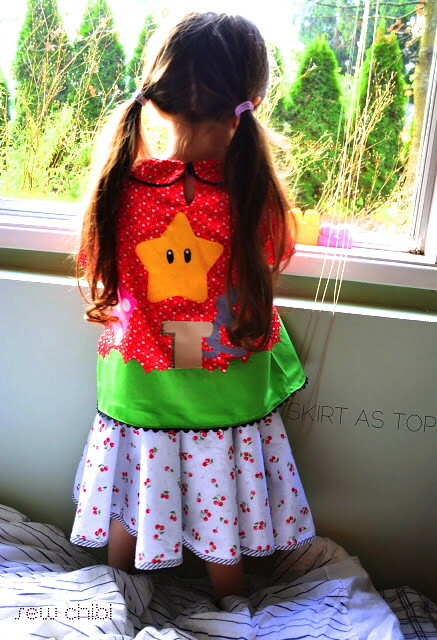 remember back when Kat from Sew Chibi made that awesome twilight sparkle skirt for Em (which she wore today!)? well when someone gives me a gift like that, i must reciprocate. it’s just how i am. if you’ve given me a handmade gift and i haven’t sent something in return, you should know that it’s probably on my to do list! luckily Kat got brighter photos for her blog post, which you can read right here! she made an awesome shirt to complement it, so go check it out. two words: CHOMP CHOMP. my skirt was made using You & Mie’s awesome tutorial for a reversible circle skirt. on one side, i did a super mario bros. scene like I did for O’s shirt a while back. 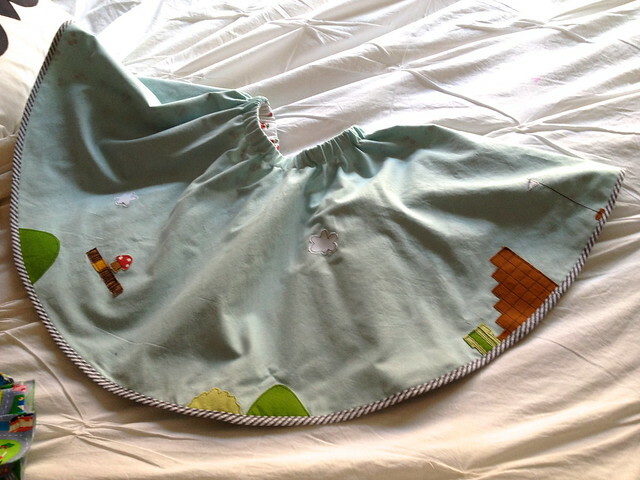 it would’ve been fun to keep appliquéing a huge mario scene all around the skirt, but I ran out of time so I just did the front. It has a few more things than his shirt did, though, like the flagpole at the end of the level! on the reverse side, cherries! cherries factor in to Super Mario 2 more than the original, but i thought they’d be fun. 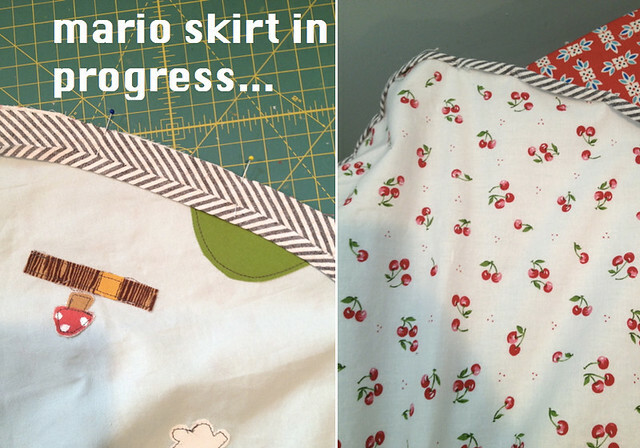 the fabric is from joann (and you can see a hint of the awesome shirt Kat made)! the bottom edge is seersucker. it was funny, i was a little nervous to give something I sewed to Kat, who has such a fun, colorful, over-the-top style i thought it might be too “quiet” for her, but she seemed pretty darn excited about it (their family is all a bunch of video game nerds) and i realized there was probably no one better to give a super mario bros. skirt to! haha. what reminded me to post this is Kat just so happens to be a finalist in the voting to add the final contestant(s) to the next season of Project Run & Play! you can check out her recap of recently sewn items to see what i mean about her creativity, and vote for your favorite at Project Run & Play! voting closes sunday evening. wouldn’t she be fun to watch?! i can’t believe it’s been almost a year since i competed in PR&P…i was in season 3 and they’re about to start season 6! my how the time flies. we also celebrated O’s second birthday this morning! can’t believe that either, it feels like i just had him! i must be getting old or something. AHHHHHH! Kristen! Thank you again for the skirt- Azy just adores it!!!! I really must try Cherie’s tutorial sometime. The skirt is so sweet! I can’t wait to see Em’s holiday dress, I know it’s going to be no less than exquisite!!! Oh Kristen!! For now, THANK YOU, tomorrow I will send you a proper email!! What about Mannheim Steamroller? 🙂 What a twirly skirt! Super cute. I KNOW! what was i thinking?? i was writing the post in a bit of a rush. Mannheim is the best for sure. Super cute skirt, Kristin!! I loved Super Mario Bros., love the cherry twist on the reverse! Thanks Stef! Sorta like your reversible wrap circle skirt, but a different look! Still need to make that one of yours…ugh, that neverending “want to make someday” list! I CANNOT BELIEVE I WON!!!!!!!!!!!!!! I love your blog and your creations … I can’t believe I get to have the doily clutch made by Kristin of skirt as top … WOOHOO!!!! 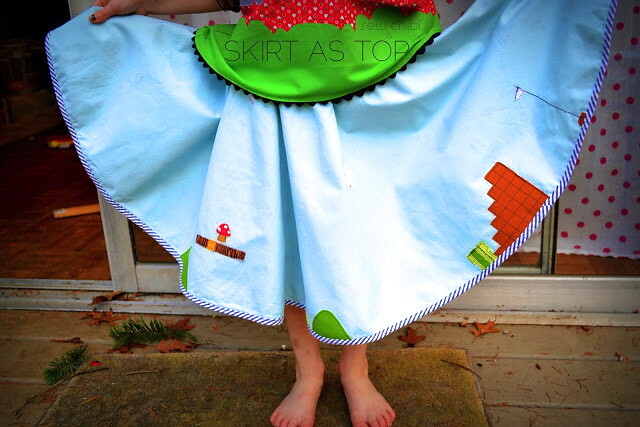 This skirt is so awesome! And we love Sufjan Steven’s Chirstmas album as well! It’s the best. I also like O Holy Night – maybe because I rarely hear it. I’m so burnt out on Christmas music already! There are like 18 Christmas songs that just get played over and over and over and over…. If you feel like you are getting old now, just wait until they are in grade school! Jude is in 2nd grade and I am starting to feel soooo old. I have to remind myself – “I’m only 31. Many women haven’t even started their families yet!” In a year, we’ll be halfway done raising our oldest. So crazy! Great skirt, Kristin! You sure know how to take it to the next level. 🙂 and I love the cherries on the reverse side, they look so cute with Kat’s awesome shirt.